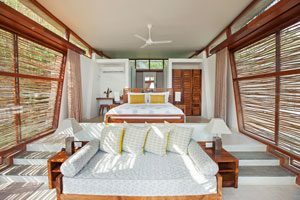 Tri is a whorl of geometric ingenuity and awe-inspiring beauty – Sri Lanka’s first truly contemporary, sustainable luxury design hotel. 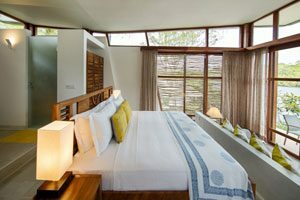 Mirroring nature’s ubiquitous Golden Ratio, Tri spirals ten unique suites around an island promontory flanking Sri Lanka’s finest lake. Guided by nature, evolved by aesthetic passion, and fortified by an all-encompassing sustainable philosophy, Tri is a masterpiece of forward-thinking flair, where mathematical marries artistic and intelligence embraces emotion. Living walls, green roofs, solar hot water, recycled wood and entirely local materials unify accommodations and landscape. Sequential spaces emanate from a central water tower that captures spectacular 360-degree views. Creative experiences stimulate the spirit and intellect. We proudly showcase Sri Lankan culture and its wealth of natural beauty and human ingenuity. 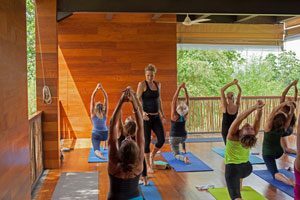 Yoga, Ayurveda and other holistic treatments, as well as all manner of beach and lake activities combine pleasure with fitness and well being.